What's that I hear you say? Another indie brand. Yep, that's right. 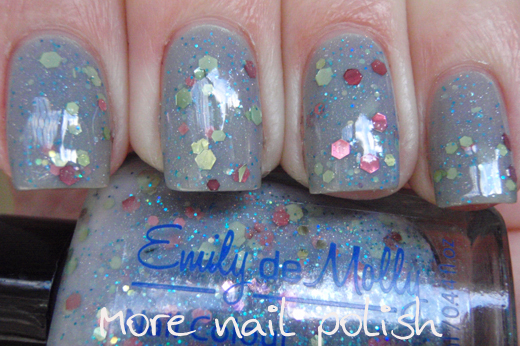 Today I'm sharing with you two polishes from another Australian indie brand, Emily de Molly. Hayley, who creates the Emily de Molly brand sent me five bottles 'just to get my opinion on'. She was happy for them not to be shown on my blog and just wanted to hear what I thought about them. But the instant I saw the polishes I knew there was no way I was not going to show these polishes here. The other awesome thing for me, is that this is a local product. I'm super proud to see another local Canberra girl creating polishes, and I'd I like to think that I played a little part in her (as well as all Aussie indie brands) getting started by fostering the relationship with Beauty World nearly one year ago. Milky Way has pale pink and green glitter in a milky grey jelly base. There are also very small pale blue hexes and a fine holographic dust in the base. For this mani I layered two coats of Milky Way over one coat of Lilacquer Zorg Industries, topped with one coat of Seche Vite. 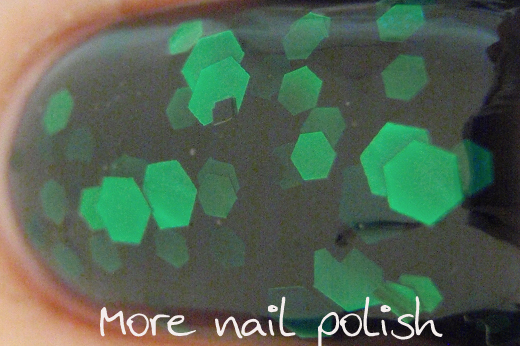 Black forest has emerald green glitter in a black jelly base. There are also a few random small black squares, but you only really get to see them if one layers on top of one of the green hexes. This one is pretty sheer, and when I put on the first coat I thought I probably should have layered it over black. But because I really wanted to have that squishy jelly look, I stuck with it. I'm so glad I did, because it only took three coats to be opaque enough for me. There were some parts that were a little transparent still, but they only show in the photos, not in real life. Three coats topped with one coat of Seche Vite. I'm sure I don't need to gush about how much I love these polishes, you can see for yourself how gorgeous they are. Application was perfect for both of these polishes. The glitters did not clump and they spread out evenly on the nail. Dry time was normal and I didn't end up with any dents (even after applying three coats of Black Forest). I love the presentation of these bottles, it is very professional. Depending on the polish colour, there are a variety of different coloured labels. Black, Gold, Silver, Blue. Professionally printed labels really make a big difference for me in the establishment and development of the 'brand'. It seems more credible and not like a flash in the pan, 'make a quick buck' kind of venture. These are very nicely done and I'm looking forward to wearing the others as full manis, just like I did with these ones. Emily de Molly polishes are available from her Etsy store for $10USD. Black Forest is so deep and amazing! I love it! Crap Cathy I haven't swatched mine because I ordered mine way back when her bottles didn't even have labels and now that you've swatched them, I don't know how I'm gonna match up to it lol. Great swatches as always! These are gorgeous and I admit that when I skimmed through to look at the photos I thought at first that this was a major, professional brand. It really does make a difference to produce professional labeling and packaging for an indie brand. Yay! I love Hayley's polishes and she's also a really nice girl too! :) I don't own any of her polishes yet but they're so pretty and unique! Milky Way is so pretty! A lot of her polishes are really stunning. The only let down is that shipping would take a long time if I ordered them, but it's not her fault. I'm sure it's worth it though. I love these polishes!! I've been drooling over them for like a month, trying to get together the funds to get them- it's pricey with shipping, and they take like 3 months to get to the US... but soooo worth it!! I ordered from her at the end of June and have been dying ever since waiting for them too arrive! EdM polishes are stunning and she put up so many new colors since my last order that even though it hasn't arrived I'm feeling horribly tempted to take the plunge and buy more! I want every shade she has made that's how pretty I think they are!